Back in April we heard that Intel was creating a discrete GPU dubbed Arctic Sound. A Motley Fool analyst shared some details of the plan, saying it started off as video streaming processor project. In the wake of the arrival of Raja Koduri at Intel the project became more ambitious, Arctic Sound would be split into two families; one aimed at data centre streaming and so on, the other at client applications - gaming and professionals. Koduri is said to want to "enter the market with a bang," with the Arctic Sound dGPU - but when will it arrive to create a three thoroughbred race, challenging the might of AMD and Nvidia in this field? A new report published by analyst Ryan Shrout, often seen over at PCPer, reveals that Intel's first discrete graphics chips will become available in 2020. The information was revealed by Intel CEO Brian Krzanich during an analyst event last week. 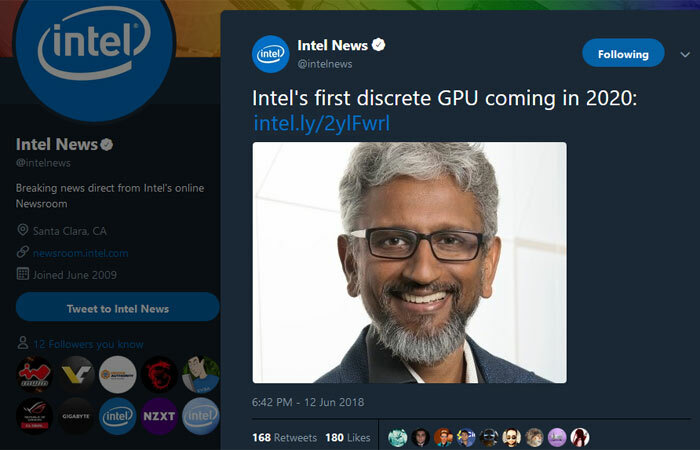 As further confirmation of this timeline and ambition, Intel's official Twitter news channel shared the Tweet you can see below. In his MarketWatch analysis, Shrout says that a rumoured CES 2019 launch would be impossible and it was never a timeline adopted by the company. A three year graphics architecture and chip development cycle, hitting the 2020 window is already aggressive and ambitious enough he suggests. Fleshing out the data centre possibilities mentioned above, Shrout says that Intel could use its in-house design GPUs as part of its wider-scale AI and machine-learning strategy. We often hear Nvidia and AMD talk about similar use cases for GPUs. Though 2020 is a long way off, the above news should put AMD and Nvidia on notice. Intel with its high-tech manufacturing muscle and engineering talent has today set the alarm clock ticking for the red and green teams. larrabee attempt 2 10 years on. Will these actually see the light of day for retail? To be fair the i740 did make it to market some 20 years ago, it just wasn't very quick but I guess good enough to get integrated into chipsets and then evolved into cpus where it still isn't very quick despite using quite a lot of a modern cpu die. Didn't they tell us 10nm would be coming in 2014? It's still not here. Koduri might make a difference, but his Vega effort whilst at AMD was less than stellar. Now that they have bought the tech in via AMD, I am expecting them to produce something decent. Intel have a good foundation in fabrication, combined with tried and tested IP from AMD, they should create something good……should…. I wonder how much of the co-operation on the intel/AMD APUs was just to fill out their address book for later headhunting?